A guide providing special instructions for accessing e-books and specific journals. Dickinson's subscription provides access to all Chronicle articles, including those marked with a green '✓Premium' icon. Create a free account on the Chronicle of Higher Education Website using your Dickinson e-mail address, and when you log onto the site with that account you should have full access from any computer in the world. Go to Chronicle.com and click on the “Log In” link at top right of the page. On the login page, underneath the "Log In" button, click on "Create an Account"
Enter your name and your Dickinson e-mail address, and fill in required sections of the account setup form, including Institution = Dickinson College. Scroll toward the bottom of the page and click on the “Create Free Account” button. You should receive an email soon. Follow the directions to verify your e-mail and create a password to activate your account. After you create an account and log in, look for "Premium access provided by Dickinson College" at the top right corner of the Chronicle site, which indicates that you are connected to the Dickinson subscription. 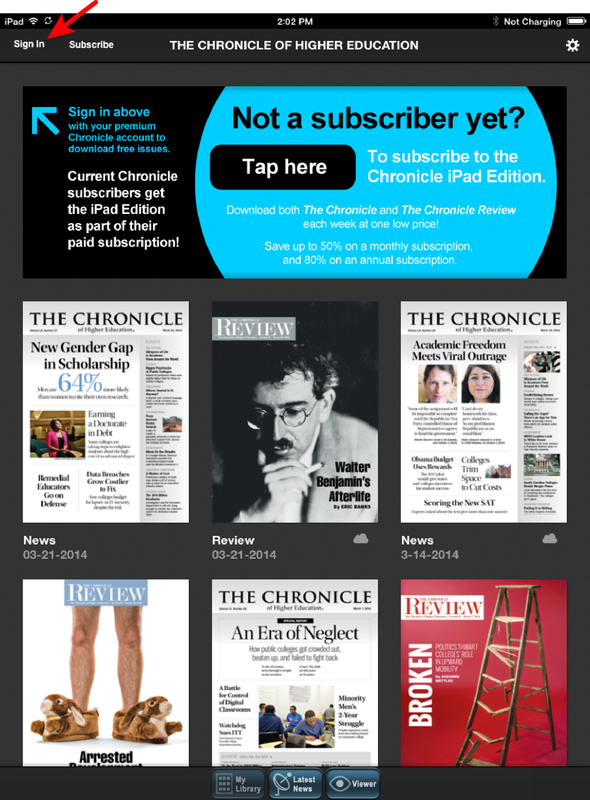 The Chronicle iPad app allows you to read and download issues of the Chronicle specially formatted for the iPad. To use the app, you have to first create a free account on the Chronicle website using your Dickinson e-mail address (as described above), then log into that account on the iPad app. On your iPad, download the Chronicle app from the App Store. Once downloaded, the app will always appear within the Newsstand app. Open the app the Chronicle app, then tap "Sign In" on the top right. Type the log in information for your Chronicle account associated with your College e-mail address. There is no Chronicle app for iPhones or Android devices, but you should be able to access the Chronicle's articles through the Web browsers of those devices, as described in the Off-Campus Access via Computer section, above.